PR Web, Opli.net: Anitoa Systems, a Palo Alto startup established in 2011, announces what it calls the industry’s first 3e-6 lux ultra low-light CMOS Bio-optical Sensor and solution kit aimed to portable medical and scientific instruments. Anitoa’s single chip CMOS Bio-optical Sensor is capable of detecting 3e-6 lux narrow band light at 550nm with 20nm bandwidth with a better than 13dB SNR in the operating temperature between -25 to 85C, consuming only 30mW. Anitoa sensor is a small, 5mm x 5mm, and said to be manufactured in mature 0.18um process by "a world-leader specialty foundry." The new compact sensor is expected to replace the bulky and expensive PMTs and cooled CCDs widely used today in molecular diagnostic instruments. "Anitoa uses process optimization and novel circuit techniques to reduce the various noises of CMOS image sensor to achieve high signal-to-noise ratio. The excessive noise that cannot be eliminated in the chip, due to limitations of physics, is further computed and filtered through software algorithms that “understand” the statistical nature of different sources of noises and signals in the system," the company's whitepaper says. Anitoa’s single-chip CMOS Bio-optical Sensor is available in the form of a “Solution Kit” for customer evaluation and early adoption. This Solution Kit includes Anitoa’s ULS 24 CMOS Bio-optical Sensor IC, an interface board, and integrated Intelligent Dark-current Management algorithm. The solution kit is priced at $1,500 each. 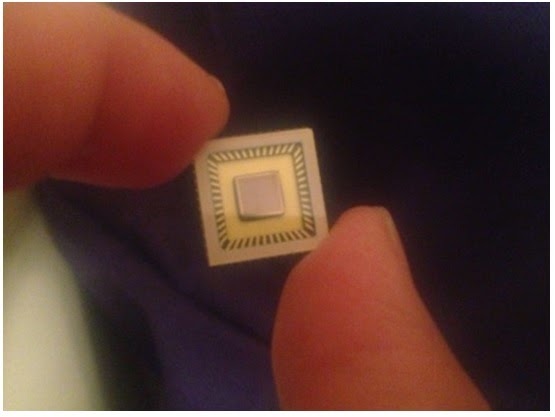 Volume production of Anitoa’s ULS24 CMOS Bio-optical Sensor kit is estimated at 2Q15. Anitoa executive team members have played leadership roles in well-known Silicon Valley IT and biotech companies such as Philips, ST Micro, Agilent, SST, Promega, Chiron, and Novartis. Anitoa partners with Zhejiang Nano-systems Institute (ZCNI), and the First Affiliated Hospital of Zhejiang University in China for clinical application validation and field deployment in that region. It doesn't look serious. A lot of number confusions in their statement: 15dB <-> 13dB, 2e-6 <-> 3e-6. I think the confusion is from Vlad's summary, not the company's information. If you look carefully, 32x32 has >15db @ 2e-6. 24x24 has >13db @ 3e-6. I looked around and can't find the 32x32 version anywhere, so I don't know where Vlad got that table from, but it certainly isn't from any of the links in the post. My table is from the opli.net link in the beginning of the post. You are right, it's different from the one in Anitoa's whitepaper. One very important point is that it's not enough defining the capability of a sensor to work under low light conditions only mentioning the number of lux. With the same irradiance in lux the acquired signal and hence the SNR will depend with the exposure time. This data isn't mentioned and then is not a good figure of merit. A modern low noise cmos sensor can pproduce noise levels in the order of a single electron per pixel. In this case this sensor is not as good as seem.
" We chose 200mS integration in high gain mode for this series of measurement. We did so in order to demonstrate how the fluorescence detection system can be adjusted to obtain the optimal signal for the dsDNA being studied." I might even go a step further and say that defining the capability of the sensor in terms of lux only is futile at best and misleading and possibly cheating at worst. If I remember my basics, the lux is defined within a visible spectrum. Visible to HUMANS, that is. Which means function goes to zero beyond 750nm, or before ~380nm. We humans really can't see all that well outside of the 400-700nm band. But silicon is actually very good at seeing below 380 and above 750. So in theory, if I have a lux-meter set up showing nearly zero lux, but my light source is at 800nm NIR... I can pump almost unlimited photons into the scene while maintaining close to zero lux!!! I've always wondered why lux were chosen instead of a unit that would include the entire silicon spectral response curve. Wonder no more. Lux is completely sensible when you want to compare the sensitivity of a device to human vision. In that case you want to compare over the same spectral range. Useful for cameras for humans, for sure. It is one number instead of an entire spectral response. Lux also has many downsides as you mention. Not the least of which is that not all people have the exact same photopic response. with 200ms exposure time, then you can have detection threshold at 2.5ulx. By doing some signal averaging, the performance is possible.